Port Blair is the major city and town in the Andaman Islands. The city is an important historical center of India and has a number of historical places to visit. Places to Visit in Port Blair includes historically important places, zoo, monuments, and beaches. Travellers can choose their favourite destination and plan their trip accordingly. Port Blair is the main point of departure for other places to visit in Andaman and Nicobar Islands like Havelock Island, Neil Island, Rangat Island, Great Nicobar Island and many others. Apart from tourist places in Port Blair, travelers can also make a day out to nearby islands and villages to explore more about these Islands.Below are some of the most famous tourist attractions in Port Blair. Museums are important tourist attractions of Port Blair which display the part of the Indian history to the world, which was left untouched and unexplored. The island group is host to many types of museums including those on marine life, local tribes, forests, vegetation, fauna etc. All the museum are open throughout the year except on some particular days in a week which might vary from museum to museum. Most children love to visit these museums but the adults too enjoy the visit. Built by the British, the Cellular Jail is today a most famous place to visit in Port Blair and the whole Andaman Islands. The jail acquired its name due to the nature of the rooms designed as cells, used for solitary confinement. 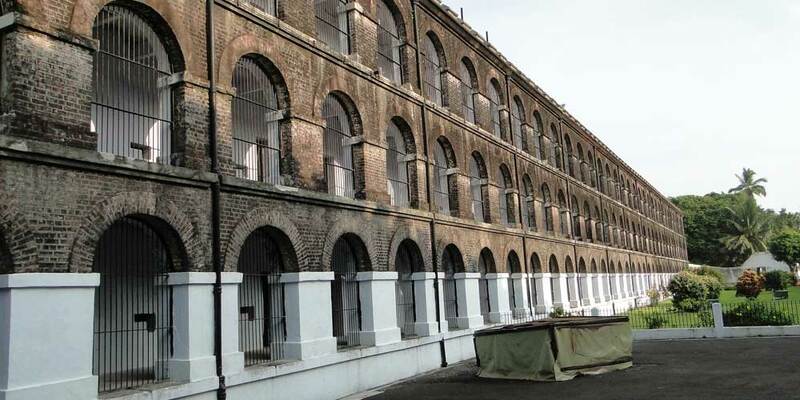 Cellular jail is also known as ‘Kala Pani’. The construction of the prison started in 1896 and was completed in 1906. The patriots who raised their voice against the British Raj were sent to this jail, where many perished. The jail is now declared as a national memorial and is a place of pilgrimage for freedom fighters. The jail now hosts a light and sound show. It also has a museum, art gallery, and a photo gallery. The museum was established in between 1975-1976. This museum is for all those who interested in knowing about the life and times of the tribes of the islands. The major attractions of this museum are Jarawa chest guard, shamanic sculptures and much more. The museum has on display various articles like tools, handicrafts, art and crafts, photographs provide a glimpse into the way of life of the indigenous tribe. A complete tour of the museum will take around 1hour. In case you are not the anthropological nut, you can prioritise and consider making this short and informative visit, depending upon your interest. If you think a museum is boring, well think again. Get ready for a different kind of marine experience in Samudrika museum. Samudrika is derived from the word Samudra, meaning sea and as the Andaman and Nicobar area is surrounded by sea. It is, also called Naval Marine Museum. The exhibits in the museum include some 350 species of marine life and a variety of shells and coral found in the islands. It’s a must visit place in Port Blair. At the entryway of the museum, a massive skeleton of blue whale greets the tourist. 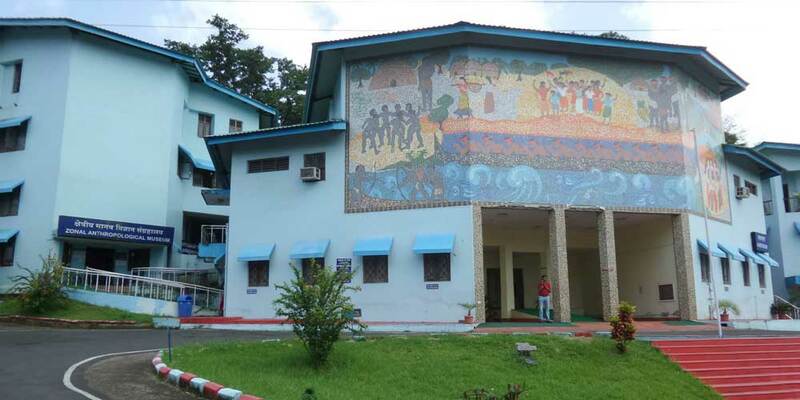 Museum is divided into five different rooms, each of them showcasing a different face of Andaman Islands. First room deals with the geographical history of the islands. An aquarium in the second room is teeming with fishes of all shapes and sizes. Third and fourth are the houses of different kind of corals and shells. The fifth room gives information about the tribal life in the islands. You can also purchase and take home some souvenirs from the gift shop to remember a one in a lifetime trip to the beautiful island of Andaman. To make the tour worth it, the Indian Navy makes sure the place is well maintained. It is the part of the National Association of Zoological Survey of India and situated in the locale of the Andaman Islands near Andaman teal House. It was established in the year 1977 to study the faunal diversity and marine life of Andaman and Nicobar Islands. The island is enriched with tropical plants and animals of some, which are exclusively found on these islands. The museum has a wide range of collection from the world of Zoology. 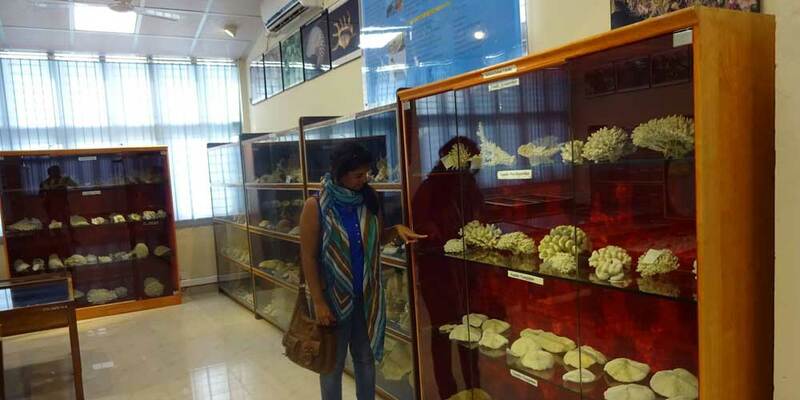 Among the many museums that make up the tourist places in Port Blair, the Zoological Survey of India Museum offers a variety for the nature lovers. Not only does this museum showcase marine specimens, but also displays mammals and birds. Research students, scientist and animal enthusiast will find this museum quite informative. Do check out the museum library, which houses an exceptional collection of books on flora and fauna found in the region. The library in this museum holds more than 1400 books on islands ecosystem and marine life while the museum displays more than 1200 specimens of various marine and terrestrial animals on these islands. Entry inside the museum is free of cost, but photography is strictly prohibited. It is located in Hadoo region, which is situated on the outskirts of the capital city of Port Blair at a distance of the only 29Km. 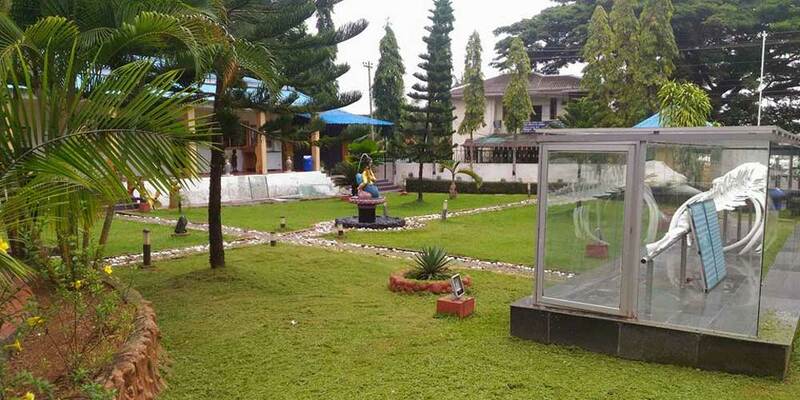 This museum is managed and maintained by the ‘Forest Department of Andaman and Nicobar Islands’ and it is popular for its wooden artifacts associated with the forest and the variety of flora and fauna found in the forest. The forest department also carries out researches and the outcomes of these research activities can be clearly seen in this museum. 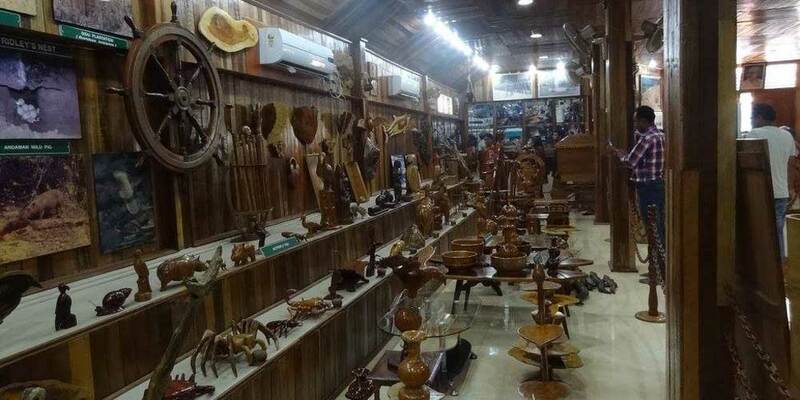 The museum displays a wide variety of wooden products, which indicated the artistic skills of the locals. As the name suggests, this is a museum which gives you the details about the forestry of Andaman and Nicobar Island and some of its wildlife. The complete information about the wildlife and the prevalence of forests in the islands has been systematically collected and shown in an interesting manner. This museum is an interesting place to visit for the environment and forest lovers. The forest museum also incorporates a Mini Zoo and a Zoological Garden, which are the major means to attract a number of tourists to the place. As the Zoo Houses a, few species of small animals and birds found exclusively in the Andaman forest, while the Garden is home to some of the alive endemic or endangered species of plants. The museum helps the visitor to get some insight in the forestry and related activities. One can see many attractive models in timber showcased there. A visit to the Forest Museum can prove to be quite a fulfilling experience. This museum stays shut just on Sundays and all the national occasions. Visitors have to pay a nominal fee to enter the museum. A must visit destination in Port Blair, Fisheries Museum is located in a very strategic position where tourist can spend the entire day, as it is not only close to the Rajiv Gandhi Water Sports Complex but it is also surrounded by the Marine Park an excellent picnic spot and the children’s traffic park- another great picnic spot for kids and families. This museum is enriched with different varieties of fishes and underwater sea creatures, which are found in and around of Andaman Sea. It is a place where more than 350 types of marine life have been preserved within it, of which almost all are exclusive to the Andaman and Nicobar Islands and are rarely found anywhere else in the world, leave alone the Indian continent. The museum has a vast amount of Seashells that range from little too expansive and huge sizes shells, aside from being rare with a display of beautiful fish and corals stored behind the Indian Continent. 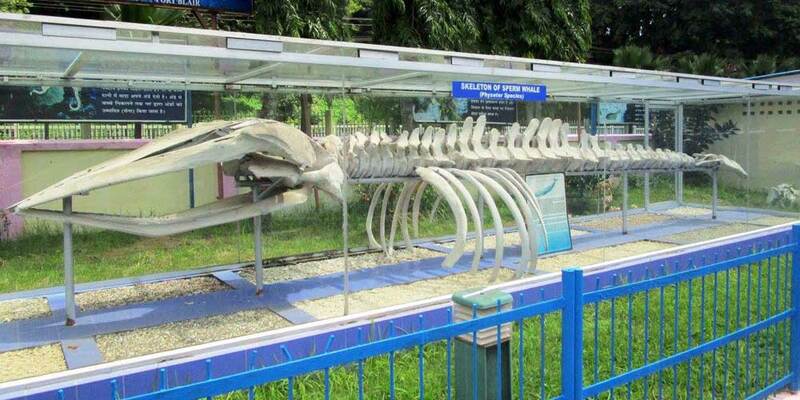 The skeleton of a sperm whale, known for being the largest toothed whale and life-size display of dolphin and sawfish are some of the interesting sights you could take in the museum. This Museum is the perfect spot for kids it offers a great opportunity for children as well as adults interested in the different forms of marine life-giving or endemic or endangered. It is a great opportunity to learn about the habitats of marine life and also discover that how unique Andaman is from many of its counterparts. It likewise gives an awesome chance to find out about the habitat of marine life. This kind of intense preservation and information broadcast about marine life is rarely found anywhere else, within or outside India. Fisheries museum is closed on Monday and public holidays, while the visitors have are charged a nominal entry fee for entering the premises. Photography is not allowed inside the museum. It is situated near Port Blair and attracts tourists for its soft and sandy beaches. Corbyn’s Cove is a coconut palm fringed beach, which is ideal for swimming and sun basking, facilities like restaurant, bar, changing room etc are available near the beach. This beach is good to chill out in the evening, water sports facility also available here. And, yes Do not miss the Japanese bunkers here, which were built during World War ll by the Japanese Army. It is located approximately 7Km south of town and it shouldn’t take more than half an hour to get there. It’s an amazing beach and one of the top tourist attractions in Port Blair. Mundapahar beach is preferred for swimming. It is approximately 3Km from Chidiya Tapu. 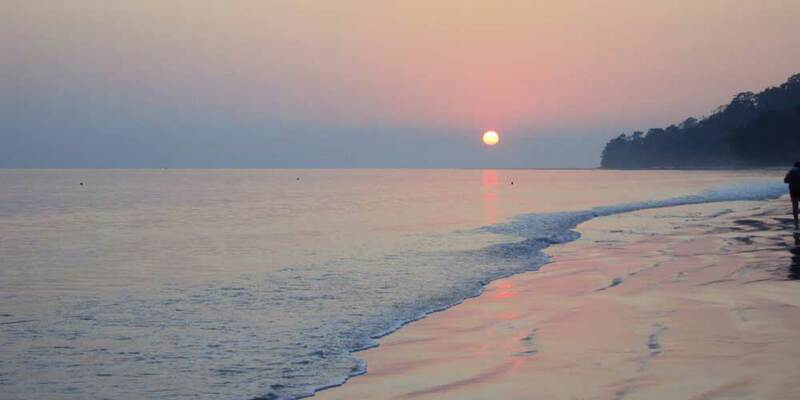 The beach is ideal for bird watching, sunset view, and panoramic scenic beauty. The Mundapahar beach on Chidiya Tapu is a sought after picnic destination. Beautiful star corals and other sea shells can be collected on the beach. Very few know that this destination also hosts a trekking trail. The 1.5 Km Mundapahar trek is a pleasure treat. The trek is covered in approximately in 40-60 minutes of time, depends on how fast you are. Mundapahar is covered with a dense layer of mangrove trees and is an excellent place for trekking which takes interested adventurers to the other side of the island that opens up to an unending stretch of water with the horizon spreading its arms out to the ocean. The trekking experience on the Mundapahar can also be turned into a day picnic since the way to the southernmost tip of the island has an abundant supply of water and delicious food along with benches set up at small distances. 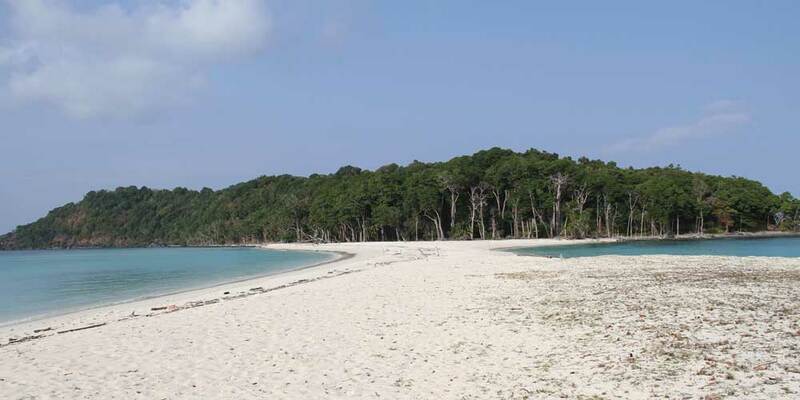 This island is located in South Andaman, being located at a significant distance from the city the place is completely isolated. The island is divided into North Cinque and South Cinque, which are connected together by a sandbar giving the whole island a spectacular look. Cinque Island should be regarded as one of the most beautiful islands in Andaman’s. It has clear emerald water with a visibility of up to 80 feet. Cinque Island is the part of Mahatma Gandhi Marine National Park along with 15 other islands. The underwater coral garden and the extremely rich marine life lends a colourful and absolutely stunning beauty to this island. If you want to experience nature to its basics, Cinque Island is the perfect destination for its crystal clear beaches, abundant greenery, and marine life. The island is also open for a variety of water sports like scuba diving, fishing, swimming, and snorkelling. Coral reefs, seaweeds, colourful fishes, shells, starfish, salt water crocodiles, turtles and water snakes are the very common part of the scenery of this island and these should definitely be explored. 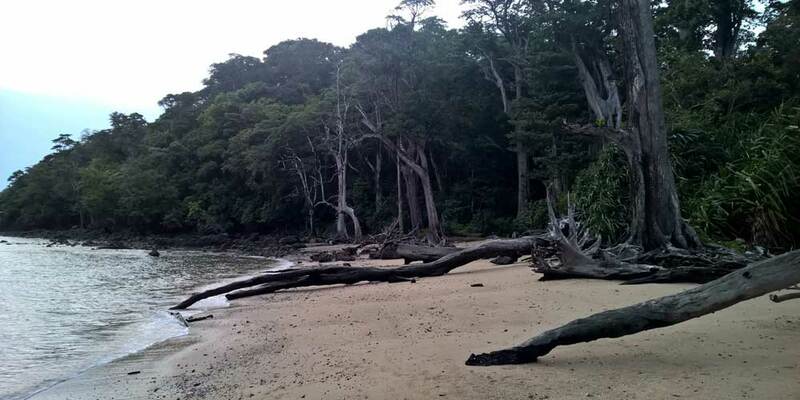 The island is situated 26 Km from Port Blair and is accessible through almost all major islands by boat. It is one of the best places to visit near Andaman. However, no scheduled ferry services are available for the place. One will have to hire a chartered boat of permitted category. In order to visit this place, permission has to be taken from the forest department. Apart from its natural charm, the place is also known for its sunset scene. Famous for its sunset, the chidiya Tapu is among places worth visiting in port Blair, Not only does it offer an incredible view of the Andaman Coast Line, but the place also houses over 40 varieties of regional birds. 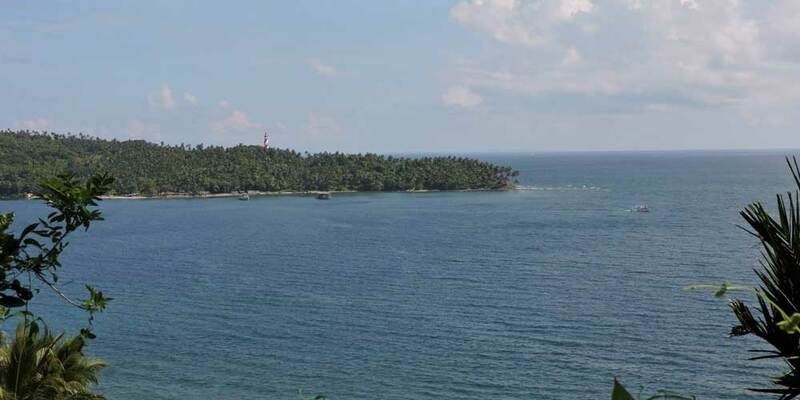 Chidiya Tapu is 25Km from Port Blair and it is well connected by road. However, there is a dearth of public transport. Private vehicles can be booked easily. Being one of the best places to visit near Port Blair, Chidiya Tapu is well known for its rich collection of birds, white spotted deer and orchids, draws many visitors and is the perfect place for nature lovers. The main attractions here include the Chidiya Tapu Biological Park, Chidiya Tapu Beach, and the Mundapahar Beach. The water in this region is alive with bright corals which make it an excellent site for snorkelling. Incidentally, Chidiya Tapu beach offers a variety of sea shells which makes shell craft a prime industry of the Chidiya Tapu. Some of the shell products which are sold here are table lamps, bangles, decorative boxes and show pieces. One can also go trekking till Madhuban through the jungle and explore the area. The Madhuban trek is roughly 16Km and is an exhilarating experience. The highest point in South Andaman, Mount Harriet is roughly 15Km by ferry from Port Blair. Havelock and Ross Islands can be viewed from this peak and make for an exceptional backdrop. Mount Harriet National Park is among must see tourist attractions in Port Blair. It is situated in Hadoo, Port Blair. 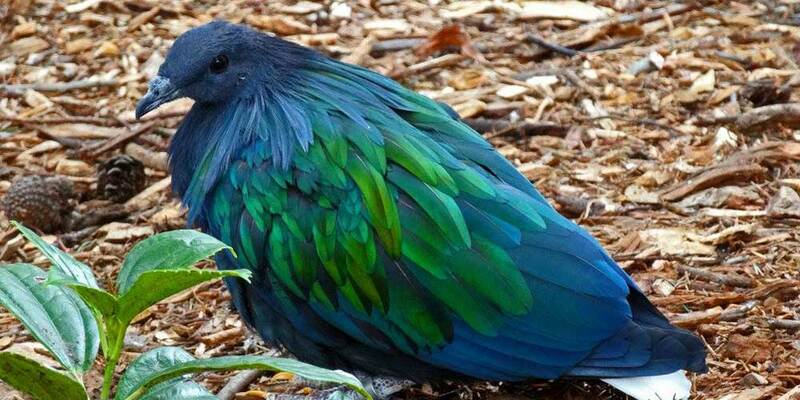 some of the rarest species like Nicobar Pigeon, the Andaman pig, can be seen in the Mini Zoo. The popularity of the Mini Zoo is attributed to the crocodile farming and breeding programs. There is a crocodile farm inside the zoo, which is a breeding place for crocodiles, which are later released into the coastal mangrove swamps. The Zoo has a very limited collection of wild species. There are nearly 200 species of the birds and animals in the zoo. After the opening of the Chidiya Tapu Biological Park, most of the animals have been moved there. A visit to the Mini Zoo need not be on the top of the list. Zoo is closed on Monday and holidays. One of the major tourist attraction in Port Blair, Gandhi Park is an integration of natural brilliance, artificial creations, and historical monuments. 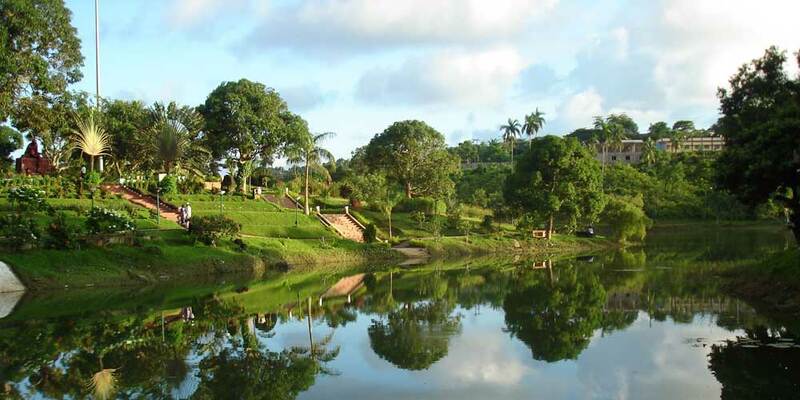 The park has facilities like amusement rides, safe water sports and nature trail around the lake, garden, restaurant and historic remains like Japanese temple as well as a bunker. Gandhi park attracts many tourists from around the world. 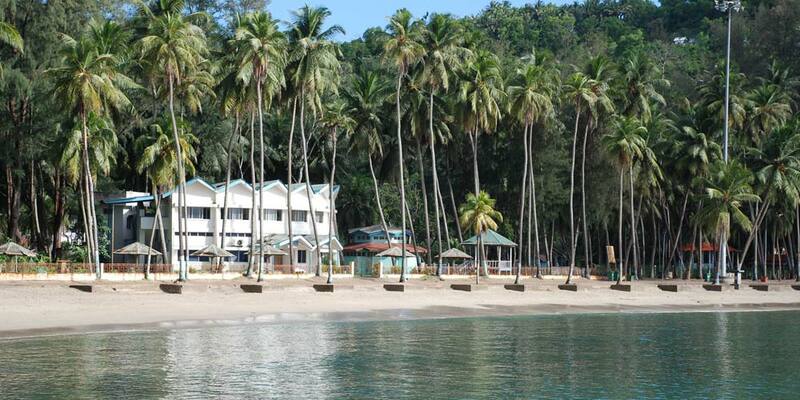 There are umpteen places to see in Port Blair apart from the picturesque and serene beaches. Chatham Saw Mill is one such place to discover in these cluster islands. The Mill was set up under the British administration in 1883 and is a well-known wood processor in Asia. Asia’s biggest and oldest Chatham Saw Mill is situated at Chatham Island. 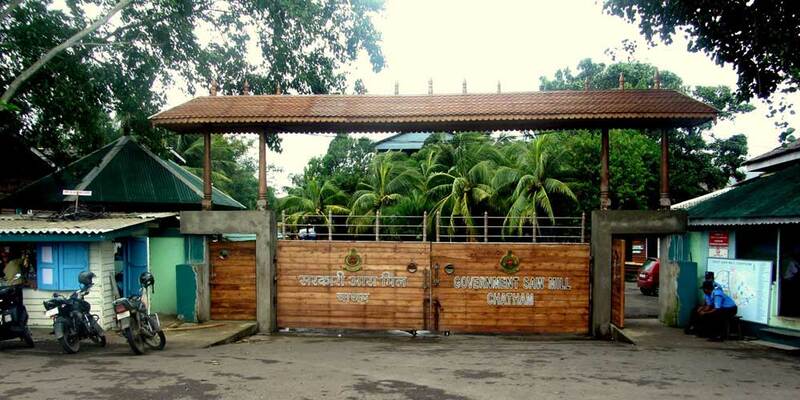 Amidst the popular tourist places in Port Blair, the mill is quite an attraction for the young ones. The place is nicely maintained and one can witness vintage wood cutting machines and practices. As soon as you land in Chatham it is all wood around. Large piles of woods can be seen being loaded, unloaded, sorted, cut and moulded. Chatham Saw Mill also produces sawn timber and handles the production of ‘Padauk’- Andaman’s well-known premier wood. It may be surprising news for you that the beautiful crimson walls of the Buckingham Palace were made of the local Padauk wood processed in Chatham Saw Mill. You can visit Chatham via road from Port Blair, the 100 metres long Chatham bridge connects Port Blair with Chatham Island or you can take a ferry ride to Viper and North passage Islands from Rajiv Gandhi Water Sports Complex. The mill is Closed on Saturday and Sunday. Entry fee is nominal. Visiting Chatham Saw Mill is definitely an interesting expedition for the people, who like to know the island history and to learn about an aspect of life they would not otherwise explore. You can also buy artifacts made of Padauk wood from this sawmill area. It was established in 1959 as the ‘Soil conservation and Demonstration centre’ and converted into Horticulture Farm in 2003. The area is maintained and owned by the Government of Andaman and Nicobar Islands and the Central Agricultural Research Institute, which are responsible for and engaged in pursuing studies about spice cultivation and researching methods to improve the cultivation at the same time. The Sippighat Farm is 14km away from Port Blair on the way to Wandoor. It covers a vast area of about 80 acres of cultivated land. The whole area is dedicated to the research and development programs for improving the cultivation of spice plants like Cloves, Cinnamon, Pepper, Nutmeg and another plant like Vanilla, Betel nut, and Coconut. Medical plants are also grown here. Some of the best properties of the medicinal plants have been displayed here as well. The rare orchids, which are found in these islands only, various species of flowers and ornamentals plants can be seen here. Good quality spices like Cloves, Cinnamon, Bay leaf, Black pepper and Nutmeg can be purchased from the sales counter. They have also built a small pathway around it so that you can have a good look, making it easier, efficient and informative for you. Another attraction of the farm is the presence of various species of migratory birds, which makes it a must visit place for ornithologist or birdwatchers. Another thing about the farm is that it is only a few kilometres away from the Mahatma Gandhi Marine National Park and SAI Water Sports Complex, so tourist can not only enjoy nature’s beauty but also enjoy the white sandy beaches and engage in water adventure sports if they like. Best time to visit is during the month of October until the end of March. The farm is open from 9:00am to 1:00pm . Bus service between Port Blair and Sipphigat farm is good. This is one of the finest farm on the island, a true treat for nature lovers. You can spend some time exploring the rare verities of flowers and spices. If agriculture and farming are what interests you, you could visit the Sippighat Agriculture Farm. Great Post and Good List of Tourist Places in Port Blair. All are the most famous destination one can visit in Port Blair. A beautiful city i would say. Not so crowdy and amidst the beautiful nature. All the museums in Port Blair are amazing. Cellular Jail in Port Blair is the must visit place and the light and sound show is just amazing. It is the famous kala paani jail we used to listen in our childhood. Anthropological Museum is quite amazing and its collection is also awesome. I visited Port Blair Recently and it was amazing trip to Andaman Islands. We liked the light and sound show at Cellular Jail the most ,while Chidaya Tapu was also amazing to see sunset in Port Blair. There many museums we visited in Port Blair and all were amazing. The list of attractions above is amazing since we missed many of these. Will cover the rest in our next trip to Andaman. 3n/4d plan cost how much budget?